One of the fantastic things about education is that it forces you to do a lot of things you wouldn’t ever dream of doing without the spectre of obligation upon you. I would have sincerely doubted anyone who told me that I would find myself deeply, embarrassingly in love with Citizen Kane. Yet so it is. Personally speaking, I think the reason that I didn’t appreciate Kane on first viewing was that I first watched it as a literature student. While it wasn’t a film that I disliked enough – or was arrogant enough – to dismiss (though there are plenty of those), I remember being distinctly underwhelmed. Rewatching it now, I can see that the reason its revered by filmmakers and film writers is for its use of specifically filmic techniques. Kane is rife with cinematic tricks. 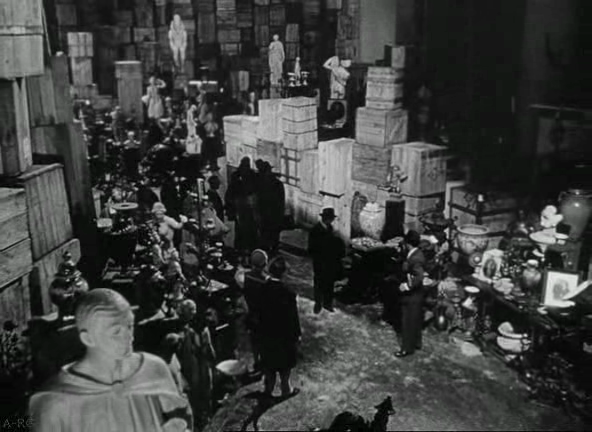 Non-genre films are rarely noticed for their special effects (most likely this is because they are in the service of an unshowmanlike verisimilitude rather than self-conscious spectacle), but according to Pauline Kael eighty percent of Kane’s stock was treated to add multiple exposures and impossible compositions. 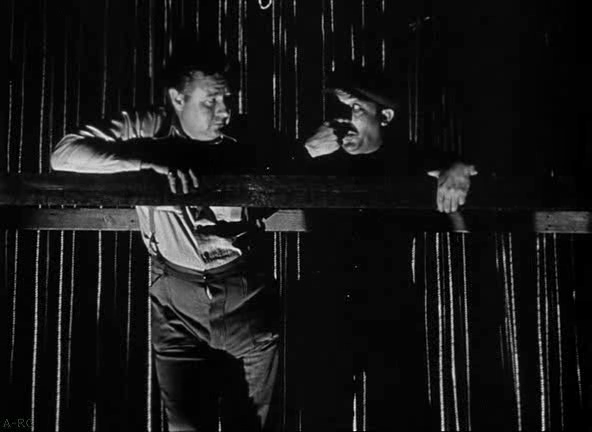 It’s a treat that’s only half-baked (or worse, given Orson Welles’ famous dismissal of the McGuffin of Rosebud as ‘dime store Freudianism’) for the literature student because of all these ‘distracting’ stunts and visual gimmicks. That said, it’s also a film that you kid yourself you know better than you do. It’s been often parodied to the extent that the shorthand of Kane=Rosebud is known to those who have never seen the film (if Family Guy were less relentlessly shallow and anti-art, it might realise that its maelstrom of reference and inserts is at least in part in debt to Kane. As in all areas, the more recent Fox animation pales in comparison with the original and best’s take on Kane). It’s also contains multitudes – scenes from multiple viewpoints, achronological structure and a sketch-like approach that leaves whole scenes floating free from a digestible narrative context – and these multitudes are conveyed in such a frenzied, hyperstilized fashion that it is hard to encompass them in recollection. Furthermore, the film can feel like listening to someone playing two different songs, in quicktime, simultaneously. The Screwball speed of the dialogue – just one way in which The Social Network plunders from Kane’s storehouse – is constantly competing with the density of imagery before you. It’s a great shame, because if it held non-classic status, people would be able to be personally seduced by its greatness. Discussion and division amongst respectful – and healthily disrespectful – peers is what makes for a worthwhile critical community. I certainly felt betrayed by Shakespeare when I finally turned to Hamlet, and I think as a play it’s a victim of its unimpeachable reputation. It has been some time since the tides of critical debate have lapped against Kane’s greatness. Without the thudding consensus, audiences would take it to heart as a cult item and allow it to breathe and be reconsidered. I think those who dislike it should take the time to make an impassioned and brattish call against it (it’s a far from perfect film). Unfortunately, I’m not the one to hack it down so that others can rise to its defence: I loved it. And I loved it for its small moments. 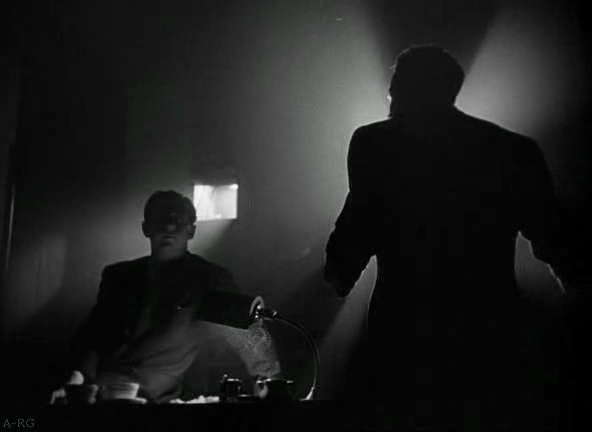 Citizen Kane continually offers you the compliment of getting the hint yourself, especially in its most minor touches. There’s one shot I’d like to say a brief word about that stands in for any number of others with such plangency. 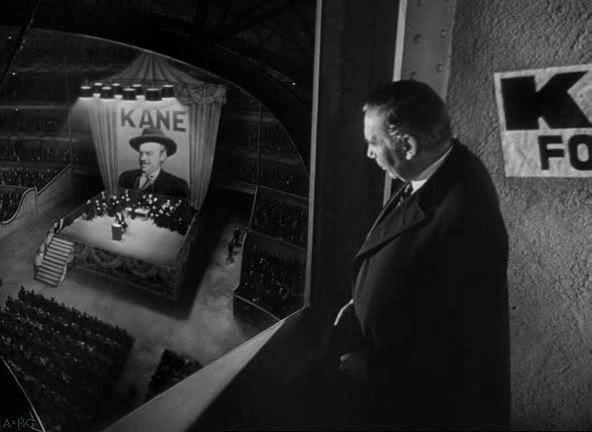 It’s a short shot in which Jim Gettes watches over Kane as he makes his demagogic and presumptuous speech to the masses. 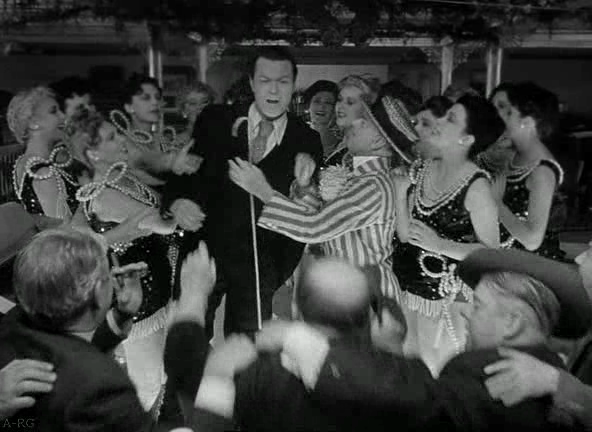 The comparison to The Triumph of the Will is obvious (its imagery was well-known in Hollywood at the time; apparently, there was a constant petty struggle to borrow MOMA’s copy of Riefenstahl’s film), but the fashion in which Kane’s failure to rise to political office is preempted in this scene is nothing short of genius. At the height of his grandstanding, the action cuts to a high window showing Jim Gettes – though we don’t know him yet, even though we’ve heard his name decried endlessly in Kane’s speech – surveying Kane’s peroration. 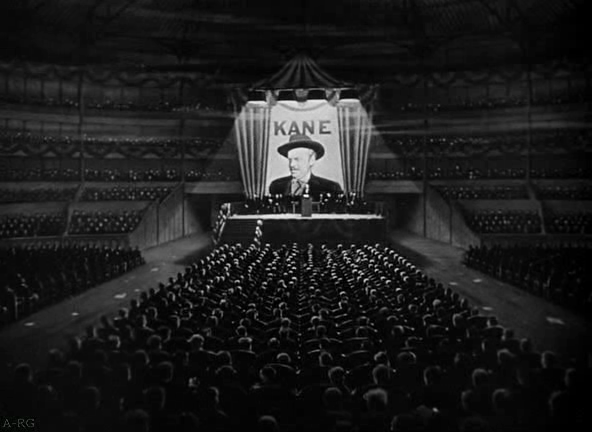 This new viewpoint has a sense of fatalism about it, with Kane’s laughably hubristic campaign poster dwarfed and his ambitions brought to a footnote in history; there’s something funereal about the fashion in which Gettes dons his bowler, and, at this height, the stage has a hint of the scaffold about it. Obviously, this position above Kane has a sense of omnipotence and puppetry (we see it pay off in the next scene as Gettes’ machinations come to a head), but there is a deeper visual meaning that is specific to this film in particular at play here. 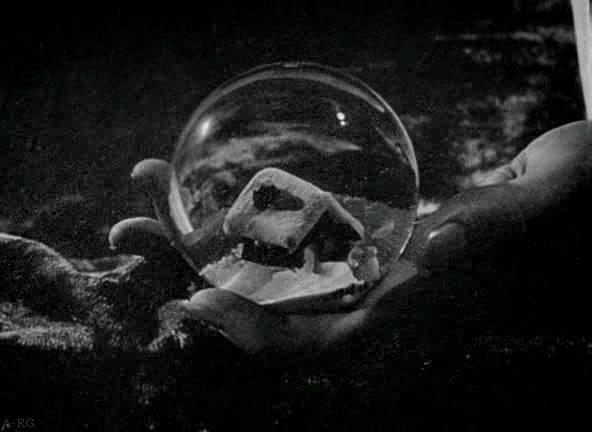 In Kane, there’s a visual scheme that links memory with miniaturisation (we shrink into the snowbound scene through Thatcher’s diary, but more importantly the snowglobe allows this thought to be held in the palm of his hand). With this shot, we see Gettes and the camera simultaneously bury Kane in history, reducing his ambition to the same frustrated, painful past as the snowglobe scene. It’s a piece of filmmaking of incredible economy, that only becomes more so in trying to capture it in mere leaden words. It’s ironic that a film about a man whose biography cannot be told because of his elevation, is itself obscured from view by critics who prevent us from truly seeing it for its high esteem. But I can’t really fault anyone for voting for it as best film ever: like the gimmick of Rosebud itself, the secret of Citizen Kane’s genius are forever out of grasp and therefore forever compelling.